How to use a free/inexpensive applet to remove leading and trailing silences from digital audio tracks. The various rippers out there do an awful lot of cool things for you automatically but they can't do everything. And one of the things few do is trim leading and trailing silence from your MP3s. There are a number of reasons why there might be stretches of silence preceding or trailing a song on a CD. The most common is probably laziness, as the recording producer saw no reason to be neurotic over this issue. After all, we are talking less than a second in most cases. The next most common reason is intentional. Perhaps Track 7 was long and slow, and the producer wanted three or four seconds of silence to allow you to savor it before starting with the hip-hop beat of Track 8. Unfortunately, the break between tracks could come at the end of Track 7, the beginning of Track 8, or split between the two. And when you freely mix the songs you listen to, you may well play Track 8 first, or even a track from a completely different album. So the silences that may have made sense on the CD, do not make sense when the tracks are ripped. There's also a distinction between digital silence and analog silence. Digital silence is simply a stretch of time in which the waveform is expressed by a string of zeroes. Analog "silence" may be very quiet, but can include a light hiss or even a rumble or quiet 60-cycle hum, depending on how clean the original music source was. There are a number of tools out there for stripping the silence from MP3 leads and tails, and many or most of them are free. However, I've tried several and the easiest to use of the bunch don't work as well as the one I've come to rely on. 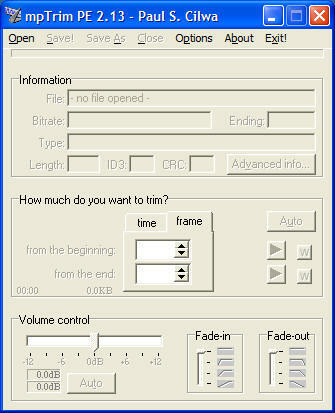 It's called mpTrim, and is available both as freeware and an inexpensive, but superior, registered version. There is also an mpTrim PRO that does batch processing, but it's a little pricey—$69.95—so you'll have to decide if it's worth it to you to not have to trim your files one-by-one. Another aspect of optimizing your MP3s is the fact that not every CD track is recorded at the same volume. Surely you've noticed that some songs on an album are recorded at a softer volume than others. Many rippers, such as Windows Media Player and SpeSoft, are willing to adjust all your tracks to the same volume; this is called normalizing. But that's a sledgehammer approach to a job that requires an artist's chisel. You don't really think that John Denver's romantic "Annie's Song" should be played at the same volume as his rousing "Gramma's Feather Bed" do you? So I do not make use of mpTrim's track-by-track normalization. Before loading our first file, we'll want to adjust one of the options. Click on Options and then the "Silence" tab, and check "Auto-detect the silence when opening the file". You have to use the Open menu to find the track you want to trim. Remember where to find it: In My Documents, in My Music, then under the artist's name and the album name. Select the first song in the album and click "Open". The panel tells us that (in this case) the song has about a third of a second of leading silence and no trailing silence. Moreover, it warns that this track has an "abrupt" ending. That generally means that, when playing this CD, this track runs directly into the next. If you want to check, you can click the lower blue arrow button to listen to the track's ending. If that's the case, you can save it as is—or you might prefer to add a brief fade-out. If you drag the fade-out slider down, you can sample the effect, again using the blue arrow button, before saving it. By clicking the "Auto" button in the Volume Control area, you can determine whether the tracks in this album are likely to need normalizing. I suggest you try measuring this first on one of the louder tracks on the CD—the loudest one, if you know what that is. Usually the tracks on a CD are correct relative to each other; you either want to make them all louder (or softer) by the same degree, or you won't change any of them. The slider in Volume control is stepped; if the suggested change measures less than a step I usually don't bother making it. If more than a step, I use the nearest lower step. That way I won't have to measure every track on the CD. When you've made the changes you want, click the Save menu item, then repeat the process on all the tracks on the CD. Most CD albums can be handled fairly mindlessly. On the other hand, some, like the copy of I Can Get It For You Wholesale I just ripped, needed careful checking of every single track. You can sometimes get better results by setting (on the Silence2 tab of Options) the "Silence Detection" to either "Aggressive" or even "Very Aggressive" but be sure to use those as starting points, and check to hear the result before saving the file. You wouldn't want to trim actual music away, or even fading echoes! If you have the money and also a lot of tracks to trim, I can sertainly recommend buying the Pro version of mpTrim. With that version, all you have to do (once you've set the options where you want them) is drag any number of tracks or folders containing tracks, onto the applet window. It will immediately (and very quickly) trim all the files you send it and save the changes. So you do not want to do this without checking first that you'll be happy with the results (by trimming, and checking, several files the one-at-a-time way).